Mirror, Mirror, on the Wall, Which Nations Maintain the Rule of Law Best of All? If you look at measures (such as the Fraser Institute’s Economic Freedom of the World index) of what makes a nation competitive and prosperous, you’ll find some obvious variables such as fiscal policy, trade openness, regulatory burden, and monetary policy. But in addition to those policy levers, you’ll find that it’s equally important that a nation does a good job of protecting and maintaining the rule of law. This is not something easy to define or measure. It includes all sorts of characteristics such as protection of property rights, absence of corruption, honest courts, government transparency, and non-discriminatory application of laws. But one thing is clear. Nations that don’t have good rule of law are not going to enjoy much prosperity, even if they have ostensibly good policies. So it was with considerable interest that I saw that a Rule of Law Index has been released by the World Justice Project. This is the first I’ve heard of the WJP, and I don’t pretend to be an expert in this area, but the Index is interesting and impressive. And I’m a bit dismayed – but not surprised – to see that the United States only ranks #19 in their comprehensive measure of the rule of law. Here are the top 52 nations. If you look at the detailed data for the 8 major categories in the Index, you’ll see that the United States was fairly consistent, with a high score of 17 and low scores of 27. To use a classroom analogy, America is akin to a decent student, with grades of B+ in some classes and B- in other classes. Other nations display more variety. They may have a higher overall GPA (like #10 Singapore) or lower overall GPA (like #50 Belarus), but their grades for specific categories may deviate substantially. Looking at the places with the strongest rule of law, the good performance of the Nordic nations is not surprising. Countries such as Denmark and Sweden may have big welfare states, but they have very laissez-faire policies in other areas. And let’s give a special shout-out to the nation that produced the PotL. Lebanon made it into the top 50. Interestingly, the WJP must have previous editions, or at least historical data, because they also show whether countries are getting better or worse. The good news is that America apparently has more order and security. The bad news is that we’re moving in the wrong direction with regards to constraints on government power. I don’t know why the U.S. score deteriorated, but the Obama Administration’s abuse of the IRS and its lawless behavior on Obamacare might be good guesses. Let’s now look at the slow students in the class. Is anybody surprised to learn that Venezuela is in last place of the 99 nations in the Index? And if you’re interested in other nations that are in the news, the low rankings for Ukraine and Russia help to explain why these countries are under-performing (even though they both have a flat tax, which is one of my favorite policies). Now that I’ve shared this data, it’s time to acknowledge that there’s no obvious way to improve the rule of law. In my humble opinion, the rule of law is a form of social capital. And like other examples of social capital (work ethic, honesty, etc), it’s part of a nation’s culture. That being said, let’s look at some polling data from Europe that captures one aspect of the rule of law. These numbers show the extent of corruption. The moral of the story is that it would be a good thing to reduce the burden of government in countries such as Germany and Denmark, but that it’s absolutely critical to reduce the size and scope of the state in nations such as Greece, Italy, and Spain. Simply stated, a smaller public sector would reduce opportunities to abuse the rule of law. P.S. Since we just showed some data on Europe, let’s share some European humor. 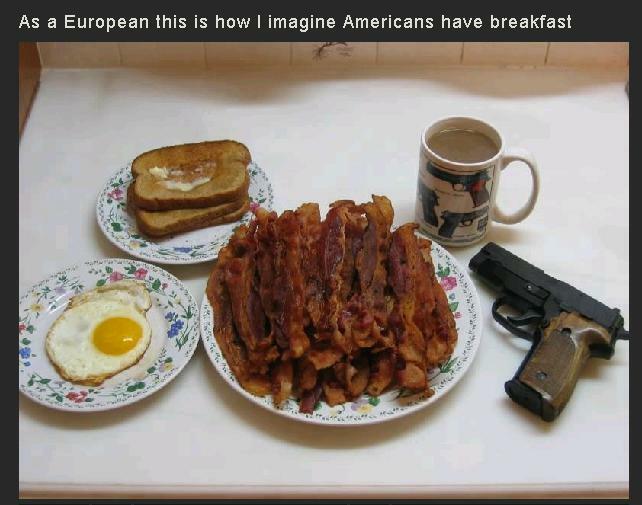 I don’t know if this is an example of someone from Europe mocking America, or someone from Europe engaging in some self-mockery of European stereotypes about America. In either case, this image is amusing. Well done, though maybe the carbs should be excluded. I’ve shared some cartoons about Europe (here and here), and this Dave Barry satire about Europe is very funny, but I don’t often see political humor produced by Europeans. The Brits occasionally step forward, as you can see from this terror alert humor and this jab at France and Germany. And this comedian definitely seems to be Greek, but that’s about it. Though it’s possible someone from Europe put together these maps about European stereotypes. Or perhaps this video about a German-Greek romantic breakup. P.P.S. There is a global ranking that puts Venezuela ahead of the United States. I’ll let you decide whether it has any merit. The adherence and maintenance of the rule of law! I wonder where Jamaica would rank if this list encompassed all nations? I liked seeing France having a good score in the corruption index but it doesn’t seem to correlate with the voluminous anecdotal evidence: books and articles about the need to pay bribes, large numbers working “under the table”. Yet another shout out for Botswana, which often outperforms several European countries in economic freedom and absence of corruption indices as well. Looks like a pretty good score for Ghana too. I”m curious. where is Israel in these rule of law charts?